In 1948, Oliver introduced a “New Fleet of Quality Tractors.” This series actually started in 1947 with the introduction of what we now call the “Old-Style 88.” This model used the same styling at the 60 and 70. It was built in 1947 and 1948 before it took on the new styling to match the 66 and 77. None of the other models used the old style sheet metal. The 88 was the largest in the series at the time with a 6-cylinder engine. The 77 also used a 6-cylinder Waukesha/Oliver engine but had a smaller CID than the 88. The 66 used a 4-cylinder engine Waukesha/Oliver engine similar to the 77. Originally, all the engines were available for gas (HC) or kerosene or distillate (KD). The diesel and LP models were introduced later in production. All three of these were available as row crops, standard, or industrial models, as well as orchards. These models are most easily recognized by their fully enclosed engine compartment. In 1952, Oliver introduced the styled 99. This model was built in South Bend, Indiana, rather than the tractor plant in Charles City, Iowa. It was a revised model of the unstyled 99, but only the front half of the tractor was revised. It used a 6-cylinder Waukesha/Oliver engine but had an open engine compartment. It was available with a gas or diesel engine and rated as a 4-5 plow tractor and was never tested in Nebraska. These were the only true Fleetline models produced from 1947 to 1954. 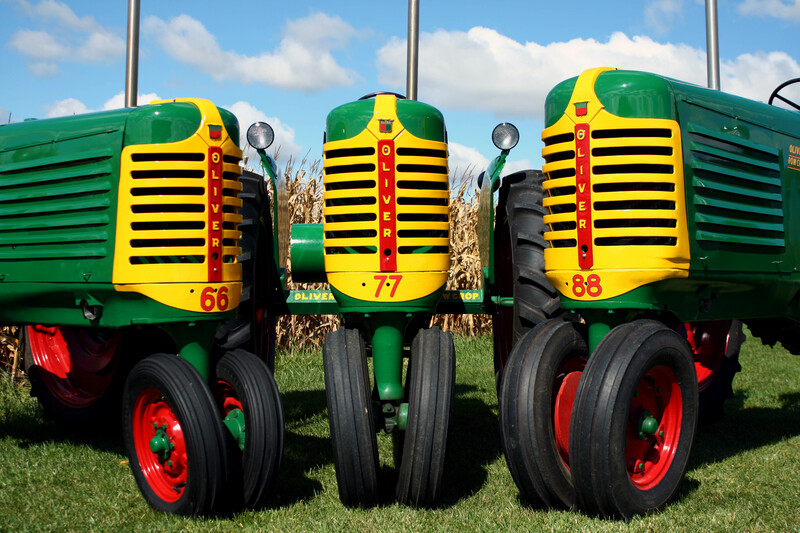 * Starting in 1953 one series of serial numbers was used for all models of wheel type tractors built at Charles City. Notice the first two digits of the serial number for the 1953’s and 1954’s are the year in reverse order.